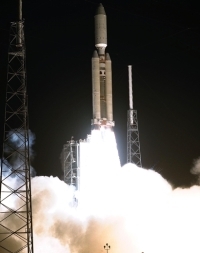 At 08:43:00 UTC on 15 October 1997 a Titan IV-B/Centaur launch vehicle took off from launch complex 40 at Cape Canaveral carrying with it the Cassini-Huygens spacecraft. Scientists from the various international participants had gathered at launch events across the globe to watch the event. After an initial delay of a couple of days (due to high winds) there was great relief when the spacraft finally lifted off the pad at the start of its seven year journey to Saturn. The launcher consisted of a two-stage liquid propellant booster rocket, two strap-on solid rocket motors, an upper stage (Centaur) and a 22 m high payload fairing. At launch the rocket weighed around 950 tonnes, with the spacraft making about 6 tonnes. Telemetry received from the spacecraft indicated that the launch was a very good one - the energy imparted to the spacecraft was accurate to one part in 5000 and the deviation in trajectory no greater than 0.04 degrees.